The main purpose of this thread is to ask your random, one-off questions about different aspects of Touhou. You should always be aware of the Touhou Wiki before asking your question. No question is stupid, and therefore you shouldn't feel stupid or shy. We treat each other with respect and try to provide useful, valid and helpful replies. When posting your answers, please try to provide as much as evidence as possible. If it is a question about canon, cite sources. If it is a question about fanon, try to provide evidence. Don't claim things if you're unsure. With the birth of #7, we're going to approach things slightly different. Don't worry! We're not going to police your questions. The main reason is to improve organisation for easy look up. - A question about Marisa and Reimu's footwear in PC-98. Moderators will do their best to organise the thread and posts if needed. Therefore, questions might be merged and some might be split into unique threads. If you have any concerns, questions or comments don't hesitate to PM a moderator! Your question has one, verifiable answer: post it here. Your question is speculative, open, with multiple possible answers: make it its own thread. That said, we'd like to raise the quality of the speculation threads, if at all possible. Pretty much any thread can spark a worthwhile discussion, but we've noticed that speculations that are either broad or can cite evidence from different sources will make for a better discussion than narrow questions that rely solely on pure imagination. It's a headband all along? I'm really confused with Junko's ability because in LOLK, she used that ability to purify fairies into pure lifeforce and because of that, Lunarians have to run away because with life comes with death. However, Zun also said that her ability is capable of bringing back to its godly nature, aka making something/somebody a god. So the question is whether her ability is the former or the latter or both? If it's both, does that make the fairies temporarily some kind of lifeforce gods? Do the lunarians reject gods from entering their terrority? Another question: Are all lunarians gods? I've read somewhere which I can't remember where that the Lunar Capital acts as a place for the greater gods to live. Not sure if that's true. One more question: Is Eirin canonically a god? There are many references that state that Eirin might be the god of wisdom, Omoikane. However, are those just references or what? Last question (Edit): What really happened after "winning" Okina during Stage6. Did Okina teleport them away or did the protagonists run away? I'm really confused with Junko's ability because in LOLK, she used that ability to purify fairies into pure lifeforce and because of that, Lunarians have to run away because with life comes with death. However, Zun also said that her ability is capable of bringing back to its godly nature, aka making something/somebody a god. So the question is whether her ability is the former or the latter or both? If it's both, does that make the fairies temporarily some kind of lifeforce gods? Chapter 15 is probably the most relevant to get the background, but 25 also contextualizes how "divine spirits" (and thus Junko) enter the picture. Yes it's pretty confusing. It wouldn't be apt to say that all Lunarians are gods, but the Lunar Capital models Takamagahara, where the earliest Shinto gods live. These gods are called the Amatsukami / Heavenly Gods, and are the gods referred to in Shinto creation myths as well as many of the famous ones several generations down. Yorihime and Toyohime for example are also Heavenly Gods, but some generations away from Eirin. It's kind of assumed that all Lunarians are either gods or descended directly from gods. Related to the above, she canonically is Omoikane, who is a Heavenly god; while the name Omoikane isn't explicitly stated in-universe, there are many pieces of information and dialogue that make it clear who she is. Out-of-universe ZUN goes as far as to say she's amongst the gods on the Moon (i.e. the Heavenly Gods) in the SoPM interview, and later says she carries the "motif" of Omoikane in her SCoOW Who's Who comment section. Kind of all of the above? She steals the magic you gathered (because it was her power that let you do so); you both leave through doors. Aya and Marisa acknowledge they had lost, Reimu and Cirno don't but are convinced otherwise. After reading CoLA Chapter 15 and 25, can I safely say that Junko is a goddess too since she's a divine spirit. If divine spirits are indeed god/goddess, didn't the protagonists beat up a truck tons of gods during TD? So, what is the reason for Okina for teleporting the protagonists away or leaving through her own door if she had the upper hand? And how come the protagonists didnt realise that they are the one running away? While we're on the subject, I have a question. Is it officially known where Kanako falls into all of this? She isn't a native god, certainly, but does this imply that she fits in among the Lunarian deities? Or is she somewhere in between? I've assumed it was one of the latter two, but I am curious if there is anything other than fanon on the topic. To just quote ZUN from his interview in Symposium of post mysticism : " My thought is that the Lunar Capital is where the highest, noblest gods live. On the other hand, Gensokyo is where the more friendly, indigenous gods live. ". So Kanako fall into the second category. The creation of the Lunar Capital was that Lord Tsukoyomi fled the earth with his relatives ( Eirin being one of them ) to escape impurity. Maybe we can assume that most of his relatives or their descendant were or became lunarian gods. We can't even know if Kanako was alive(?) at the time. That's all i can think of. Maybe if you gain enough faith as a God on earth, you can ascend as a God on the lunar capital ? I doubt it, but we never know. The confusion comes from the fact that heavenly god and native god aren't strictly mutually exclusive. Heavenly god should be taken very literally- it's not so much a special race and more a nationality. A heavenly god is simply a god from heaven (takemagahara/the moon). A native god, on the other hand, refers to a god born purely from faith, with no divine spirit as a basis. The opposite of a heavenly god isn't a native god, it'd just be an "earthly" god. Kanako is one of those "earthly" gods, but she's not a native god. She has a divine spirit. Hypothetically, you could have a god from heaven that's made purely of faith. That said, IIRC, native gods are extremely impure. So in practice, you'll most likely never see a native heavenly god. As for the other thing, the confusion here comes from the fact that there are several concepts which we in the west consider extremely different, but touhou calls them all "gods". To put it simply (and I might have some stuff wrong), there are two kinds of "gods". The first is closer to what we would call a soul. Once a soul becomes worshipped and deified, a god, as westerners understand it, is made from a copy of that soul. In TD you were fighting very weak spirits born from people's desires, which are gods in the former sense. Junko is a bodiless spirit so she's also a god in the former sense. But neither are worshipped by any means, so they're not gods in the latter sense. 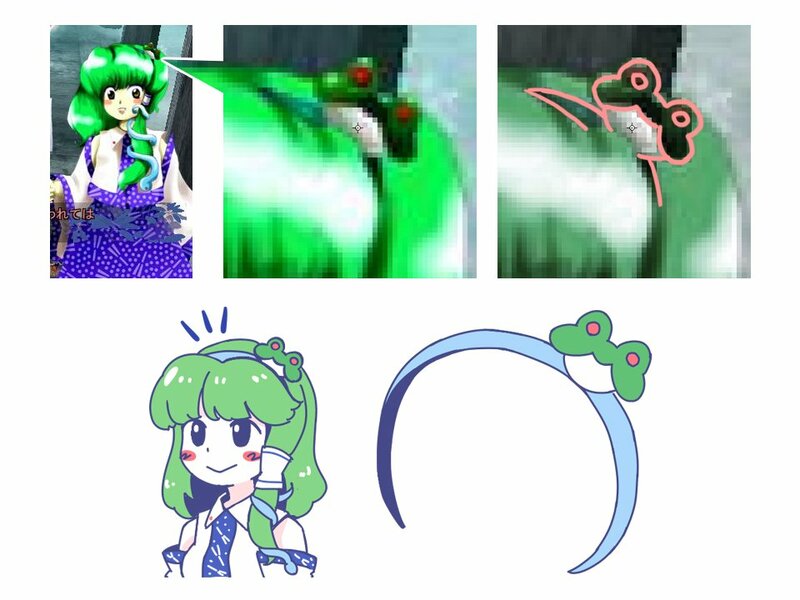 Generally touhou refers to the former as spirits (either divine spirits, vengeful spirits, or whatever) and the latter as gods, but not always, so it gets kind of confusing. EDIT: I also feel that I should add a disclaimer. ZUN has never said directly that "Lunarian gods and earth gods are the same in all but nationality", and if new material comes up that might prove to be totally wrong. He's just never given us any indication that they are different. That's besides the point either way, though. The more important thing is that Lunarian gods and native gods aren't strictly opposites, that's native gods and divine-spirit-type gods like kanako. From what I know, way way back in ancient Japan, there were lots of different tribes, each with their own pantheon of gods. In Touhouverse this would include the Moriya, Suwako's people. Then, one of these tribes, the Yamato, thought of unifying the entire land. So they conquered the other tribes, replacing their myths with their own. Kanako is one of the gods in the Yamato side. I think native gods simply mean gods from pantheon other than the Yamato's one. This symbolized in Suwako's spellcard "Central Myth vs Native Myth". Incidentally, "tsuchigumo" (Yamame's species) were originally derogatives of the remains of the native tribes. It's not really about being from a pantheon other than the Yamato one; that'd make Hecatia a native god as well, for instance. Rather, the term just refers to any god that is worshipped in a single area, different from gods that are more broadly worshipped (like Amaterasu or Tsukuyomi). Native gods are gods that are only worshiped in a limited region. When they are separated from their land, they lose their faith, but within their area, it's not uncommon for them to have more power than wide-ranging (and perhaps even the highest level of) gods. Also, to simplify things, I think it's easier to define the lunarian gods as being the big important gods from Shinto myth, while the Earth gods are the Myriad Gods and the divine spirits that receive some sort of worship. I think this is still more of an issue of conflating all kinds of "gods" as some sort of equally relevant things when they aren't. There's not much of a point in calling Junko a god as though she's the same thing as a god that's revered. She's a divine spirit because whatever her original existence was has been completely removed from how she is represented, she is the pure "essence" or kami nature of her own story. Others have posted enough to cover it, but the two CoLA chapters I posted are also relevant to her because similarly to Junko, her original identity has been "lost". It's clear that Kanako is generally intended to be an adaptation of the god Takeminakata, but deeper than that, divine spirits are they way they are because they were existing entities (typically humans or groups of humans) but have become detached and twisted from their original existence due to being worshiped (in Kanako's case) or otherwise becoming legend (like Junko). Understanding that there's a difference between the myriad gods and divine spirits worshiped as gods, the natural question that follows is why Kanako is a divine spirit while Suwako is a myriad god. This is what leads into the discussion of the nature of those two myths; the old native Suwa god was Moreya, who did not have some sort of clear historical origin (i.e. just kind of made up by locals because reasons); meanwhile the god Suwa-Myojin worshiped in Suwa and said to have defeated Moreya is now identified as Takeminakata. "Suwa-Myojin" has a couple additional stories of origin as its own thing depending on region and time period, and Takeminakata is full of chunky historical conflation, being intrinsically tied to the Yamato rule, which was of course political and very human. Also included in this is the fact that in the Suwa region itself, the god "Takeminakata" was basically never historically worshiped as such, and instead it's the Mishaguji that were commonly the target of worship and active role in rituals. This is alluded to by ZUN by having Kanako being "unable to control" the Mishaguji, which were the main cultural targets of reverence and fear at the time, and having Suwako be the one to control the Mishaguji while Kanako takes the face of leading the region. This is kind of how Takeminakata is seen today, being the "official" god but getting to that point by being slapped on and conflated with other myths to get there. In fact, this is arguably the justification for Kanako existing at all, because similarly to Miko, it's possible that scholarly criticism of Takeminakata's legitimacy is why ZUN chose to "move" them into Gensokyo. Just to add more texture to the "god" thing, tsukumogami like Kogasa are also described as kami. That's the meaning of the word "gami" at the end. This also applies to to shikigami (Ran and Chen) and shinigami (Komachi). None of these spirits would be considered "gods" in the Western sense, but kami is a much broader term than that. By the way, what even IS the term for gods born purely of faith (as opposed to having a divine spirit as a basis)? Or is there not one, and that's more a footnote of Suwako's rather than a whole category of god? Speaking of gods, is Hecatia even the same category of "god" as Kanako, Suwako, or even the Lunarians? She seems like simply a powerful...whatever she is, and her "Goddess" is just a title. Although given how gods work in Touhou, I guess she can be both. It's explicitly stated (I want to say it's in her AFiEU interview) almost word for word what you said. That "god" is just a term they use for the strongest people in Hell. A fairy can be a god down there if they're strong enough. So you're absolutely right. That would be the myriad gods. In the broadest sense they're the gods that inhabit all things (i.e. animism), and typically the term would imply that kind of god specifically rather than including the gods that have become worshiped (or to put it in ZUN's terms, "gods with names"), since in most contexts you'd just call those "gods". Well, she is based on Hecate, who is a goddess, but notably from a totally different kind of mythos. I would guess this the reason why ZUN calls her a goddess but also implies it's a title, as she wouldn't really be considered a god in a Shinto sense. Maybe. As I understand it, Okina had the upper hand because she was able to kick the protagonists out—that was her surefire way of winning. The whole "running away" thing is kind of weird, but really Okina just kicks them out and then tries to portray it as them "running away" as, like, a show of superiority or something. I asked this in the last thread but got no response so I'm copying the whole thing here. I'm here to ask for a permission to upload official? images that are missing from our wiki. - 4 different Message Papers like the one in Memorizable Gensokyo. According to the Thai wiki, each of these is received from buying PMiSS at 4 different stores: Toranoana, Melonbooks, White Canvas and Gamers. These papers are not given out anymore. Of course, the images I'm going to upload are still in Japanese. For another thing, is there any site for a Japanese transcript for CoLA and BAiJR? As I was looking at both wiki as usual, I noticed that ours misses one or two entire dialogue boxes. Since the Lunarians created a fake pure land which enabled them to live up till million of years and the Netherworld is a purer land than the moon, would Youmu have the lifespan of million of years or just normal lifespan of half human half phantom (assuming she lives in Netherworld for the rest of her life). Youmu is half phantom,so even if we assume that the Netherworld is even purer than Lunar Capital she'd probably die sooner than them,thanks to her human half "poisoning" her with impurity. Or at least that's how I think impurity works in Touhou lore. Eh, it's not being human in itself that makes one impure, it's living in the strife-ridden Earth that generates impurity. I assume that if Youmu never ever left the Netherworld, ever. she would probably live forever, but she does visit Gensokyo with some frequency, so she probably has some kegare clinging to her. It's not like she won't be living for a long time anyway, being a half-youkai and all, though. Impurity (汚れ; kegare) is lifeforce (生命力; seimeiryoku), ie: the power of nature and what fairies are made of. It's the energy that makes flowers bloom and all organisms grow. However, the act of growth also brings them closer to death; you could say life and death are two sides of the same coin. Lunarians avoid death by also avoiding life. The moon is "sterile" and therefore "pure". Similarly, the netherworld lacks both life and death, so if Youmu stayed there forever she would never grow old or die. But there are fairies in the Netherworld? Considering Mai and Satono would eventually stop becoming human if they keep working for Okina, I was wondering: What do you guys think they'd become if that transition occurs? Youkai? Divine spirit? Something else entirely? I'd love to hear your theories! They're already inhuman. They've become living puppets animated by Okina's magic. She says that if she freed them them they'd have their humanity restored. Oh wow, I never pictured it like that! Interesting, so I guess they're more or less the same as Yoshika huh? I remembered asking a question in Re: Miscellaneous Questions 6: The Questionating where I asked whether a person would go to heaven and become a celestial after attaining Nirvana. The reply I got implied that they don't and would reach a state of non-existence. So now I am pretty confused with what is Nirvana, what do you become and where would you be after Nirvana. Can someone clarify this for me?